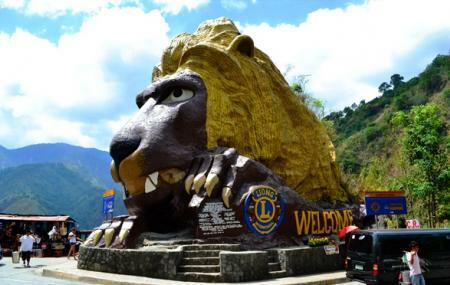 Carved by a Cordillera artist, the 40-foot high lion head, located a few kilometers from the Kennon Road view deck has become a landmark in its own right. Installed by the Lion's Club members of Baguio City as a symbol that would commemorate the presence of the group in Baguio city. Just beside the lion head are a few small stalls that sell wood handicrafts. Softdrinks and light refreshments are also sold to visitors who stop to take a photo with the monument. How popular is Lion's Head? People normally club together Bell Church and Mount Santo Tomas while planning their visit to Lion's Head. People also prefer to start their day with Lion's Head. It's good. Wish they would repaint and clean if a little bit(trash). It would look magnificent. 10 minutes finished all.beside road, only make photos. But there's some male CR really can give you surprise,if you try you will be know. And beside lions head have a tree growing on the stone, it is amazing. Nice scenic view behind the lions head. But the lion's head itself is old. Nothing special. It's way from the city is dangerous. Make sure your car works perfectly specially the brakes. But the view is worth it. Got few shops with toilet alongside this tourist spot.